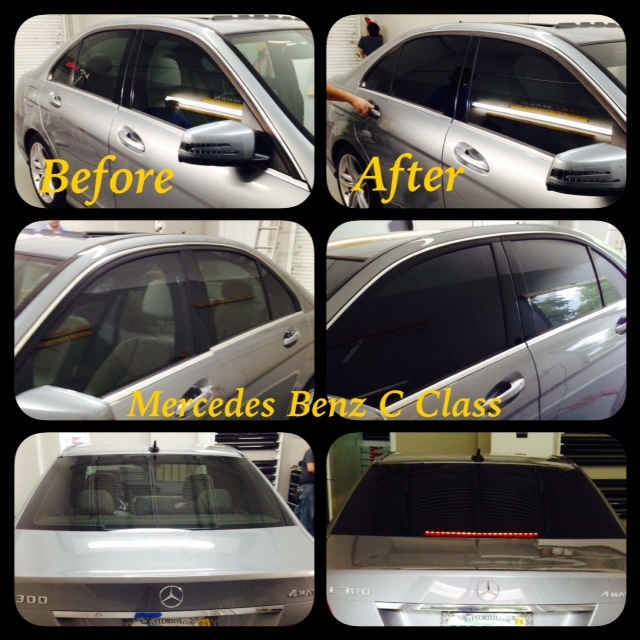 Mercedes Benz C Class Window Tint at Tint Magic Window Tinting Coral Springs. We use computerized system pre-cut films for a perfect fit. If you are looking for professional installers just call us! 954-840-7883. Mercedes Benz Window Tint looks amazing with CXP 18% all over the windows. The C-Class is the bread-and-butter model of the Mercedes-Benz lineup. All new for the latest model year, the C stands out thanks to a fluid design, more generous dimensions and a wide array of high-tech features gleaned from the S-Class flagship. The fourth-generation C-Class is 3.7 inches longer and 1.5-inches wider than the outgoing model, modifications that Mercedes explains are necessary because the average height of passengers is growing each year. In spite of its larger dimensions, the C is up to 221 pounds lighter than its predecessor thanks to a new body structure made from a combination of aluminum, high-strength steel and various composite materials. Increased rigidity and improved safety are some of the other by-products of the new architecture.